A team led by University of Utah physicists has discovered how to fix a major problem that occurs in lasers made from a new type of material called quantum dots. The never-before-seen phenomenon will be important for an emerging field of photonics research, including one day making micro-chips that code information using light instead of electrons. The study published on Feb. 4, 2019, in the journal Nature Communications. Lasers are devices that amplify light, often producing a single, narrow beam of light. The strength of the beam depends on the material with which the laser was built; light passes through the material, which produces a beam made of light waves all with similar wavelengths, concentrating a lot of energy into a small area. This material property to be able to amplify the beam's energy is called "gain." 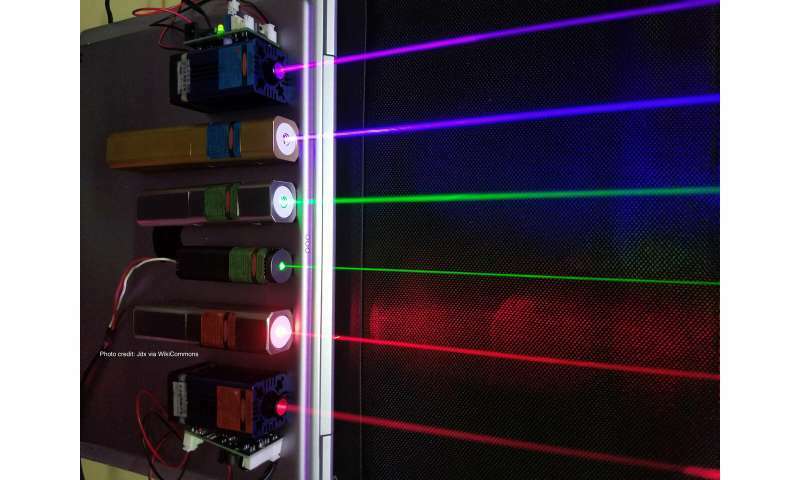 Many scientists are building lasers with quantum dots. Quantum dots are tiny crystals of semiconductor materials grown to sizes of only about 100-atoms across. The size of the crystals determines the light beam's wavelength, from blue light to red light and even into the infrared. People are interested in quantum dot lasers because they can tune properties simply by growing the crystals in different sizes by using different semiconducting materials and choosing different shapes and sizes of the lasers. The downside is that quantum dot lasers often contain miniscule defects that split the light into multiple wavelengths, which distributes the beam's energy and makes it less powerful. Ideally, you want the laser to concentrate the power into one wavelength. The new study sought to correct this defect. First, collaborators from the Georgia Institute of Technology made 50 microscopic disk-shaped quantum dot lasers out of cadmium selenide. The U team then showed that that almost all of the individual lasers had defects that split the wavelengths of beams. The researchers then coupled two lasers together to correct the wavelength splitting. They put one laser at full gain, which describes the maximum amount of energy possible. To achieve full gain, the scientists shined a green light, called the "pump" light, onto the first laser. The quantum dot material absorbed the light and re-emitted a more powerful beam of red light. The stronger the green light they shined on the laser, the higher the gain in energy. When the second laser had no gain, the difference between the two lasers prevented any interaction, and splitting still occurred. However, when the team shined a green light onto the second laser, its gain increased, closing the gain difference between the two lasers. Once the gain in the two lasers became similar the interaction between the two lasers corrected the splitting and focused the energy into a single wavelength. This is the first time anyone has observed this phenomenon. The findings have implications for a new field, called optics and photonics research. In the past 30 years, researchers have been experimenting with using light to carry information, rather than electrons used in traditional electronics. For example, rather than putting lots of electrons on a microchip to make a computer run, some envision using light instead. Lasers would be a big part of that and the to correct wavelength splitting can provide a significant benefit to controlling information through light. It could also be a major advantage to use materials such as quantum dots in this field. "It's not impossible that someone could make a defect-free laser with quantum dots, but it would be expensive and time-consuming. In comparison, coupling is a quicker, more flexible, cost-effective way to correct the problem," said Evan Lafalce, research assistant professor of physics and astronomy at the U and lead author of the study. "This is a trick so that we don't have to make perfect quantum dot lasers." As a visual learner, I would substantially benefit from more visual aid included in this article, as I can't quite wrap my head around the steps leading up to this new phenomenon. No they aren't. The author is incompetent.